How Do You Define 'Meh'? "Meh" is a word that's used to communicate indifference. Some call it the verbal equivalent of a shrug. Since a person can't exactly shrug their shoulders over text or online chat, they resort to saying "meh" instead. When somebody says "meh" in a text or anywhere online in response to a message, what they typically mean is, "I simply don't care enough about this to decide how to react to it." Kind of harsh, but it's the truth. People use "meh" when they reply to questions, or in situations where they think they should be able to express their feelings (but can't). In questions where the expectation is a yes/no answer, "meh" is often interpreted as a no simply because it's too passive to be interpreted positively. In some cases, a lack of information might be what causes a person to say "meh" rather than a genuine lack of interest. After all, if someone simply doesn't have all the facts about a particular problem or situation, they can't base their feelings on much of anything to form an opinion. Friend #1: "Hey want to go to the movies this weekend?" Friend #2: "Meh... maybe if I can find the free pass I have lying around here somewhere"
Friend #1: "Ok... how about bowling instead?" Friend #2: "Yeah that sounds like fun"
In the first example above, Friend #2 responds with "meh" to a question asked by Friend #1. Friend #1 interprets their answer as more of a negative rather than a positive. Facebook status update: "Thought about actually hitting the gym tonight, but meh, it's already 9pm and I've got a lot of work to do on this never ending essay. Good excuse not to work out, right?" In this second example, a Facebook user says "meh" in a status update to express their feelings about going to the gym. The use of "meh" is an expression of indifference given their current circumstances. Friend #1: "Hey! How are you? Long time no talk!" Friend #2: "Hey, yea long time! :) Life is kinda meh right now but not complaining!!" In the final example above, Friend #2 does something different by using "meh" as an adjective. Instead of using an adjective like "boring" or "uninteresting," they use the word "meh" to describe their current feelings about the state of their life. "Meh" is a word that should be saved for casual conversations only with people you know relatively well. Millennials and young kids are also more likely to embrace the slang word, so expect them to use it and recognize it perhaps more than some baby boomers or older people who use technology to communicate. Keep in mind that the use of "meh" can cause a conversation to fall off track almost instantly. 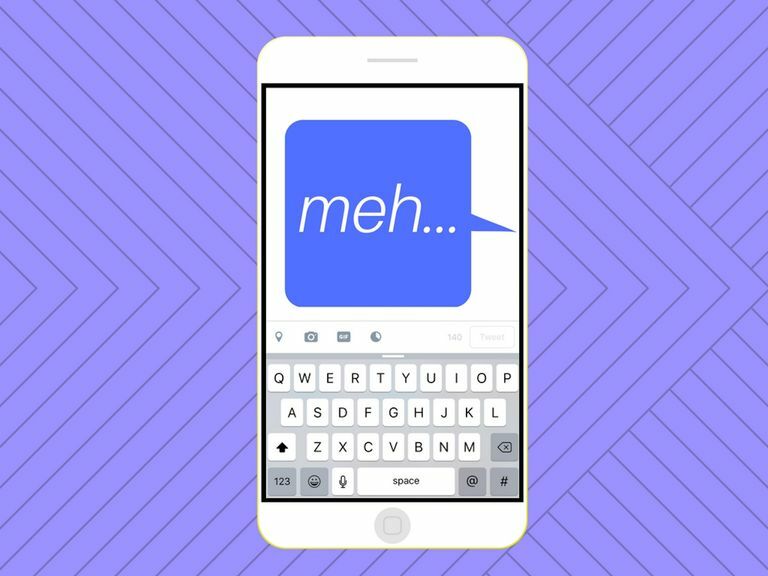 "Meh" is not a real word and therefore isn't always interpreted as a clear reaction, so the person/people you're texting or chatting with could be left confused about what you really mean and where you actually stand.